I am a big fan of bran muffins. They taste good, travel well and even freeze well. Problem is, most of them contain too much fat and sugar. Personally, I like a bran muffin without raisins. They are pretty hard to find. When I lived in Boston, I used to LOVE Stop and Shop bakery bran muffins. Knowing what I know now, I would be scared to look at the ingredients! So here is my healthier alternative, which, by the way, my three year old loves. Feel free to add raisins if you like. 🙂 I have added blackberries before and they were good! My daughter ate one right after they came out of the oven and immediately asked for a second. Does anyone else have a weird food thing like I do about raisins in bran muffins? In a small bowl, add milk to the 1 1/2 cups bran and let it soften for about 8-10 minutes. In a medium bowl, mix flour, baking soda, baking powder and salt. In a large bowl, add maple syrup, vanilla, and applesauce. After the bran is softened, add it to the maple syrup mixture. Lastly, add in the flour and mix only until combined. Spoon into muffin cups and bake for about 15-20 minutes or until a toothpick comes out clean. I got 12 muffins out of this recipe. Hope you like them! I also share your distaste for raisins in bran muffins! Have you ever tried adding a chopped apple with some spices? They still sound yummy without any fruit though so I will definitely be trying them. Thanks for sharing - I LOVE your blog! Great with chopped figs and coconut butter. If I wanted to sweeten with medjool dates instead of maple syrup how many do you recommend? I've never baked with them before. Love your blog, found you on Pinterest. Thanks! Maybe 4-5? Blend them well before adding them to this recipe. Let me know how it works out too. I'm curious! You are so welcome Alyssa! Glad you liked them! I made these over the weekend, they are delicious. My daughter gobbled hers up. Loving your blog, I've been searching for healthy snacks and morning breakfast ideas, and you've certainly caught my attention. These muffins are outstanding!!! I added chopped walnuts- so good! Thank you for this yummy, quick and easy recipe. Will make often. Many years ago I worked for a bakery, in their retail shop. They made Bran muffins using Pineapple. The bottoms of the muffins were so moist and sort of gooey from the pineapple. Does anyone have or know of a recipe like this? I don't, but that sounds delicious! 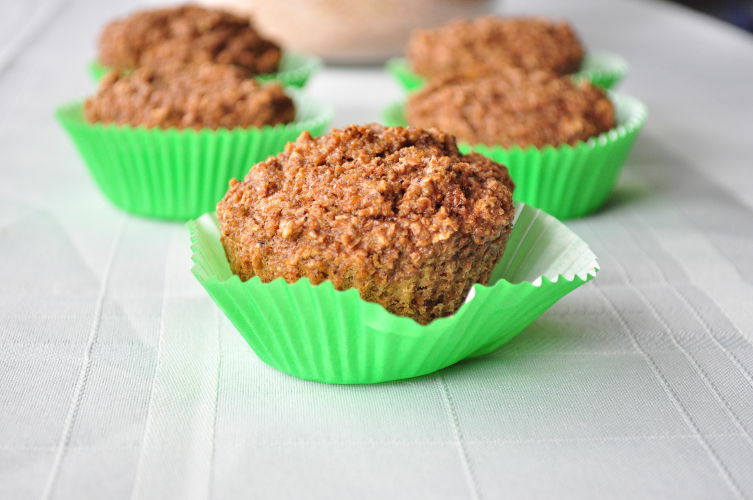 Hi - I would like to make these with oat or rice bran in lieu of wheat - do you think that would cause any issues? I think that might work. Let me know if you try! Thanks Tammy! I used to make these often and then I forgot about them. Thanks for the reminder! I think I will make some tomorrow. These might be my favorite muffins!!! i usually use white whole wheat flour instead of spelt cause thats what I have on hand.I love mixing the dry ingredients in a ziplock with a smaller one for the bran. That way when I'm in a hurry I just need to measure out the wet ingredients :-p And I have used oat bran. Still tastes great. Honestly this recipe is so plan it would be easy to add your own modifications (craisins, nuts other fruit) but it is so good I just leave it plan. Even my 3 and 4 yr olds love them. So happy to hear that Ashley! I think it could. However, you may need to up the liquid somewhere else in the recipe if the batter looks too dry.